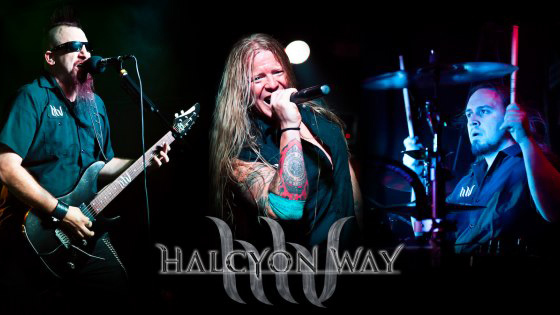 Proof that sometimes it’s a bit tougher than some folks realize to make it ‘big’ in the metal realm, Halcyon Way has been continuing ever-forward for well over a decade with their particular brand of heavy metal. From their more progressive beginnings to their current, more modern metal approach, they’ve evolved while staying true to the focus of their sound: big hooks and melodies. On their most recent effort, Bloody but Unbowed, it’s hard to escape their presence. 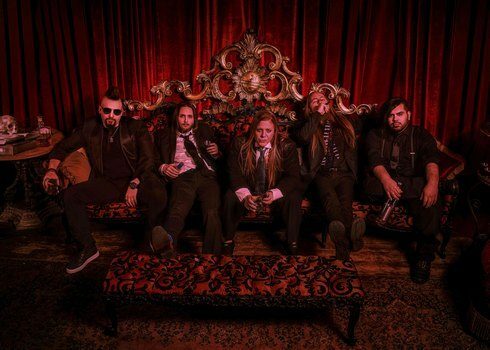 They present a varied plate of what’s great about melodic metal while keeping a sound that’s quite their own. For all their expansive diversity and catchiness, the road hasn’t always been straight-forward. But their most recent effort shows that they are heading further in the right direction. Getting their name out there with a new management team and label behind them is bound to be that needed step, and with an album as strong as Bloody but Unbowed, it’s just a matter of time before many more start to stand up and take notice of this act. We grabbed vocalist Steve Braun for a round of questions about many of these subjects, as well as some brewing talk as well. 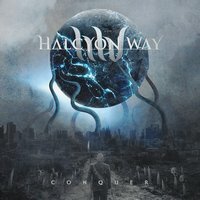 Dead Rhetoric: It’s been 4 years since Conquer, any reason for the span of time between albums? Steve Braun: We toured a lot, that’s the only thing I can relate that to. The recording process also took some time. I think we’ve had it mixed and mastered since November . We’ve gotten new management and then we shopped for a new label, so that’s why it’s been 10 months in the can already. If we had all of that new stuff in place, then maybe it would have only been three years. We’ve gone through line-up changes since Conquer. We didn’t have a permanent bass player. On Conquer, it was just Jon [Bodan], Ernie [Topran], and I. We have a new drummer and a permanent bass player now. Our bass player Max [Eve] moved to guitar. Dead Rhetoric: That’s a lot of changes! With that in mind, do you feel it affected the way that the album was written, or was it just focused by the core members? Braun: Jon and I do most of the writing together, but this time, we definitely had other people’s input. Each person put their own flavor on it. We worked on it as a band, as opposed to Jon and I. We did the skeleton of the song, and then everyone else reworked it as a band. Everyone had a part in it. The end result was cool – everyone has their own idea of what they think it should be and what they should sound like. Dead Rhetoric: You were on Nightmare Records for a bit and you got some new management, as you said. What caused the move over to Agonia Records? Braun: That was actually with the help from our manager Jeff Keller from The Artery Foundation. Nightmare had always been a label for us that was just a distribution deal. They never were truly a ‘label’ for us, per say. They were a means to get our stuff out. They never really did any promotion for us, or anything like that. To go to Agonia, even at the beginning stages we are at, it’s incredible. I can’t tell you how many emails that go back and forth between the president of the record company, the promotions guy, our manager, and our PR guy every day. It’s amazing! I think I’ve gotten more emails in one day now, than I got altogether from the other labels. It’s been great! If this is any indication of anything that will happen for us, it’s awesome. Dead Rhetoric: It’s cool to hear that things sound like they are moving forward for you. One topic I wanted to talk about was that you have so much diversity with the band, but if no one hears about it, you are in a tough spot. Braun: Yeah, and it’s been tough. Everybody gets bombarded with social media nowadays, and we need to be much more active there and get help with that. That was our downfall. We will go on tour and be busy, busy, busy and post a lot of things, and then we would go dark. Then it’s like, maybe a funny meme or something, but there’s nothing of substance every day. Now we are trying to post at least once a day, or maybe multiple times. Dead Rhetoric: How do you see Bloody but Unbowed in terms of the band’s evolution, even from Conquer? Braun: I think it’s really the next step of our evolution. 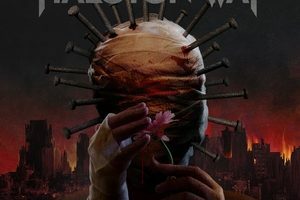 With Conquer, from Building the Towers and Indoctrination, we got away from the Fates Warning/Queensryche-esque, proggy style of writing and pairing it down into something heavier and more concise. This one [Bloody but Unbowed], continues with that. This one is definitely more stripped down than I think Conquer was. We are really excited about it. We have stayed true to ourselves. Even if we are trying to evolve into something, we are still striving to write really catchy hooks and those big choruses. If it doesn’t have that, it gets pitched. We always want to be known for the hooks and music. Dead Rhetoric: I think that’s a point where we are at in metal. There are the die-hards that put their nose up at the hooks and melodies, but there’s always a place for that. People need hooks to latch onto. Braun: Right. A couple reviews that we’ve gotten we have been slammed for [those things]. One person said we were trying to be like a Five Finger Death Punch band. I don’t see that at all, but I would gladly do that if I could reach their level of success. Then people complain that they can’t put us in a box like, “They sound like In Flames, or they sound like this or that;” they get irritated and think that we don’t have a direction. I think our music, to me, is cohesive enough to show a direction but it shows that we have a lot of varied influences. Dead Rhetoric: Right, and if you are going to play metal in 2018 and write to be put into a box, what is the point? I think a band like yours is better because you can’t put it into a box. It’s cohesive, and you can hear different influences. Braun: Everybody has a different opinion, you know? But it gets a little frustrating to hear people say that we don’t have a direction. It’s like, we have a direction – just listen to how we have progressed. Even at the beginning with the first album, which I wasn’t on, it was progressive but it was based on heavy riffs. That’s what we have done the whole time, we have just paired it down and not have all of those musical passages. It’s gotten a little simpler with our breakdown sections, and we don’t have a lot of interludes. Dead Rhetoric: Could you talk about the Nailhead choir and its impact on the album. There are a number of guests, and I saw that former vocalist Sean Shields was also involved too. Braun: Yes he was. It was really cool. We had a couple of our songs where we thought it would be very cool to have a choir. We reached out to some friends of ours who were singers. We thought it would be a great way to do some PR and have some of our friends on the album. We have Sean, a girl whose stage name is Babe Animal, who did some singing for us on “Church of Me” and we thought her soulful vocals would be nice in the choir. We had Ben Huggins from the Galactic Cowboys, and there are even a few bigger ones that will be released soon. Our good friend, Todd La Torre of Queensryche sang on it too, which was really cool. It was a neat opportunity to get our friends on there and just have a good time. It was fun to hear what they sent us. Sometimes they did it in the studio with us, or sometimes they sent it in to us, so it was fun to hear how it melded together. Dead Rhetoric: With getting the parts back at different times, did the songs metamorphose a little bit as you got them? Braun: On “Bloody but Unbowed,” we had the idea of having a big chorus and anthem, but it really turned out different – everyone has a different sound to their voice and you can imagine a crowd of people singing at the top of their lungs, which was pretty cool. But it didn’t really morph into anything different that we had, so much as taking our idea and making it better. Dead Rhetoric: With the time between albums, did you re-evaluate the songs over the time of the writing/recording? Braun: Yes and no. We originally demoed about 20-something songs. Then you start nitpicking and ripping things apart. We were under a lot of pressure for this album, because we wanted to do better than Conquer. 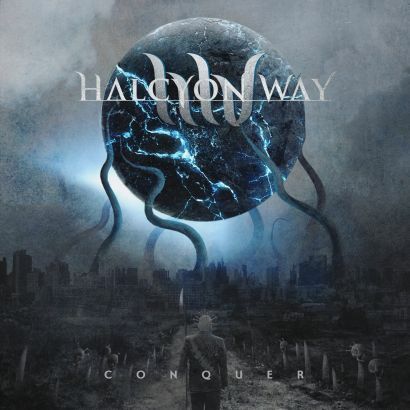 Conquer was a really good breakout album for us. When we were writing, Jon and I were very much second-guessing ourselves: “Are we heading in the right direction? Are the hooks big enough?” Things like that. It was an issue for us this time that we didn’t have before. I think that with everyone in the band putting their two cents in made it harder too, as you could guess [laughs]. Everybody comes from different musical backgrounds, so everyone has an ear for something else. That was super tough [laughs]. But I think the outcome speaks for itself. We have definitely grown. Dead Rhetoric: You’ve done a lot of different tours. What have you learned from the varied types of tours that you have been a part of? Braun: Absolutely. For one, we had to tailor our set sometimes mid-tour. We’ve been out with Saxon and Skid Row. We come out all guns ablazing with death metal vocals, and people look at you like you have three heads. We have learned to adapt on the fly and what works best. We have also learned some things from seeing other bands and what gets the crowd going. Saxon has been doing it for longer than I’ve been alive. To watch them, and just to see what they do and what works, and be able to incorporate that into our music – that’s been a learning experience. I feel like we have gone over well with a large variety of groups and audiences. We haven’t gone out with what I would think would be a perfect match for us, musically. They’ve always been like Queensryche or Angra, where they have a good fanbase that loves hard rock and metal. No band that we have been on the road with uses extreme vocals. It would be interesting to see how it would work out to go out with a band that has a mixture of what we have. Dead Rhetoric: So who would be that best fit for you guys if you could arrange your own tour? Braun: I don’t know if they would want to go out with us, but Bullet for My Valentine, Trivium, Killswitch Engage, All that Remains. We are heavy enough that I think we would work out well with them. I would love to go out with Sevendust. We would go over super well with that crowd, as they are primarily clean singing with a harsh vocal spot here and there. Most of their stuff isn’t harsh vocals at all. Those would be my dream bands to go out with. 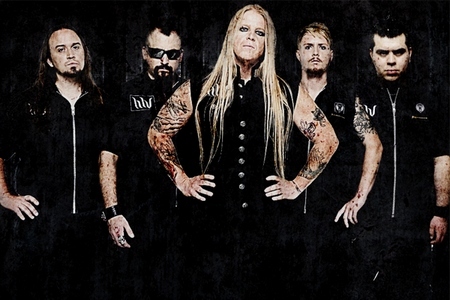 Dead Rhetoric: Do you find that Europe is a bit more receptive to your style of metal? Dead Rhetoric: Last time we talked, you mentioned you were a home brewer, is that something you are still doing? Braun: Actually no. We had built a new house about 4 years ago, so right before we had talked, and when we moved we packed up the stuff and I just haven’t gotten back into it [laughs]. I don’t know why. It’s one of those things, that you just run out of times in the day and you are like, “Oh, I don’t know. I don’t really want to do it now.” What I wanted to do, and it was on my radar to do when we moved, was to go straight to keg instead of bottle. Every time you bottle, the kitchen gets so messy because it goes everywhere. A few of my friends are really good homebrewers and they started to go to keg, so that’s what I wanted to do. I just haven’t gotten around to it. Dead Rhetoric: Totally hear you there. I moved three years ago, and did exactly the same thing. It’s a big commitment. Braun: Maybe one day I’ll get back to it. My buddies and I keep setting brew days but it gets away from you. You have to make it a priority I guess. Dead Rhetoric: Lastly, what’s in the works once the album is released? Braun: On the 25th of August, we are doing a cd release show in Atlanta. Then there is nothing set in stone. We have had a bunch of offers to go to Russia and Europe, but nothing is ready. We plan on going out in September/October, but I don’t know if it will be US or Europe. If we don’t get a US run in by the end of 2018, we are going to do one in the beginning of 2019. It’s been two years since we were out with Queensryche, so we definitely want to get back out. We did really well for a few years of doing US runs, so we are ready. We love touring Europe, but its nice to be in your own country so if you need to pick up the phone, you can make a call and don’t have to search for wifi everywhere.